For those wanting to understand more about agroforestry, read this press information on this integrated land use method for the Gabayan watershed. This is also important information for anyone undertaking land or water management work. Land use in the Gabayan watershed features a mosaic landscape that includes pasture, maize and some forest fragments. Agroforestry, combined with land and water management practices that increase agricultural productivity, can save watersheds from degradation. 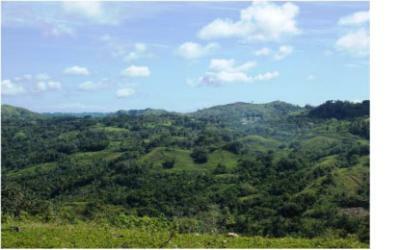 A study conducted by the World Agroforestry Centre (ICRAF) in the Gabayan watershed in eastern Bohol, Philippines, has shown that agroforestry systems create a more sustainably managed watershed that allows people living there to benefit from the ecosystem. The benefits include higher crop yields, increased income and resilience to climate change. Agroforestry is an integrated land-use management technique that incorporates trees and shrubs with crops and livestock on farms. The study, called Modeling the effects of adopting agroforestry on basin scale surface runoff and sediment yield in the Philippines, uses a computer-based Soil and Water Assessment Tool (SWAT) to simulate the effects of different land uses on watershed hydrology and the ecosystem services provided by the Gabayan watershed. The tool predicts the environmental impact of land use, land management practices, and climate change. Watersheds are areas of land with streams and rivers that all drain into a larger body of water, such as a bigger river, a lake or an ocean. Watersheds not only supply water for domestic use but also provide a multitude of ecological and cultural services, including water for irrigation and industry, shelter, habitats for biodiversity and, in very poor areas, sources of livelihoods. Over the years, however, many watersheds throughout the world have suffered from intensive resource extraction and mismanagement. In countries like the Philippines, several watershed areas in the country are now degraded due to deforestation and soil erosion. Farmers here have reported environmental problems, such as floods, droughts, reductions in water quality and increases in soil erosion and downstream sedimentation of irrigation networks. “The degraded watershed has been largely deforested and replaced with extensive agricultural and grasslands over the last half century”, says David Wilson, the lead researcher. “It has disrupted the evenness of river flow, resulting in alternate flooding and drought episodes, an accelerated level of soil erosion as well as downstream sedimentation”. SWAT was used to simulate the impacts of current land-use practices and conservation agriculture with agroforestry in strategic locations. The study results showed a significant reduction in sediment yield (20%) and sediment concentration (35%)in the Gabayan watershed under agroforestry and conservation agriculture. The study was therefore able to provide scientific evidence that agroforestry, combined with improved land management practices, are an effective land-use strategy for the watersheds. “Specifically, the use of restored areas that have vegetation next to water resources and contour planting in grasslands appear to be the most effective techniques to reduce sediment transfer to the watershed river network”, says Wilson.